NEARLY 180 RUNNERS turned out to mark Joe Salt’s 80th birthday with a 5K race around Cowm Reservoir, Whitworth. Joe is President of Rochdale Harriers and has been with the club for over 60 years, serving on various athletics committees in the North West. In 2006 Joe received the Rochdale Observer Unsung Hero in Sport award. A number of Joe’s family and friends sported T-shirts to mark the occasion (pictured). 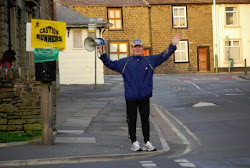 The race was won by Ian McBride of Royton Road Runners in 15 min 40 sec. The first Lady was Leigh’s Dionne Allen who clocked 18 min 21 sec. The veteran’s field was extremely strong, with Bingley’s Jon Cordingley and Sue Beaconsall winning the male and female veteran 50 category in an incredible 17 min 19 sec and 18 min 47 sec respectively. Over 30 members of Rochdale Harriers (pictured) took part in Joe’s Birthday race, with Phil Williams taking 4th position (16 min 35 sec) and Anna Blomfield being the first Rochdale lady home in 21 min 02 sec.